In a strange coincidence, another ancestor, John PARKER Sr., was also pilot for the Plymouth Company. He was a mate on the 1607 voyage to found the Popham Colony, a short-lived English colonial settlement in North America loccated in the present-day town of Phippsburg, Maine, making him our first ancestor to arrive in North America. For a long time historians believed John Parker came over to New England as mate on the Mayflower. But here one of our earliest historians was guilty of a false assumption that has been so often repeated by later writers that it has assumed the quality of being factual. He based this on a deposition found in the Mass. Superior Court files. It was sworn to by John Phillips 3rd of Charlestown on Nov. 20, 1750 stating that John Parker, his father’s uncle “was mate of the first ship that came from England with Plymouth people. “That historian concluded that “Plymouth People” were the Pilgrims and the first ship was the Mayflower. But it actually was referring to the town of Plymouth in England and the Plymouth Company ships in 1607. John Clark was born 26 Mar 1575 in Redriffe (Rotherhithe) Surrey, England. His parents were William CLARKE (1553 – 1624) and Margaret WALKER (1553 – 1601). He married Mary MORTON on 19 Feb 1599 in Stepney, Middlesex, England. John died in 1623 in Jamestown, Virginia. After Mary died, he may have married Sybil Farrar on 18 Apr 1610 in St. Mary Morton, Stepney Parish, London, England. My feeling is that a different John Clark married Sybil. Rotherhithe (pronounced /ˈrɔðəhaɪð/) is a residential district in inner southeast London, England and part of the London Borough of Southwark. It is located on a peninsula on the south bank of the Thames, facing Wapping and the Isle of Dogs on the north bank, and is a part of the Docklands area. Rotherhithe was a port from the 12th century or earlier until the 20th century, and has been a shipyard since Elizabethan times. With the arrival of the Jubilee line in 1999, the area is now rapidly gentrifying. Mary Morton (Woton) was born in 1577 in St. Elins, London, England. Mary died in 1603 in of Westhorpe or St Dunstons, Stephney Parish, Suffolk, England. Sybil Farrar (Ferron or Farr) was born Abt 1575 in Thriploe, Cambridge, England. John had a number of children, Susannah, Edward, Katherine, Thomas and George, but records about them are spotty. John Clark’s son, Edward Clark, 1590-1630 remained in England, and Edward was the father of Michael Clark 1610-1678. Alternatively, Edward was born about 1603 and was the son of John Clarke and Sybil Farr. He married Diana Hayward (Haywood) Child of Edward Clarke is Michael Clark, born Abt. 1625 in England; died October 05, 1678 in Christ Church, Barbadoes, West Indies; married Margaret [__?__] Bef. 1648 in England. John Insley Coddington argued forcefully that Thomas Clark was the son of John Clark, pilot of the Mayflower, and that he was identical with the “Thomas son of John Clarke of Ratliff” who was baptized 8 March 1599/1600 at St. Dunstan’s, Stepney, Middlesex [TAG 42:201-02]. The hypothesis is very attractive, and was accepted by Jacobus [TAG 47:3], but remains underproven. John Clark was perhaps the John Clark baptized on 26 March 1575 in Rotherhithe, Surrey, England. He first went to Jamestown, Virginia in March 1610 as a ship’s pilot. There, at Point Comfort, he was captured by the Spanish in June 1611. He was taken captive to Havana, Cuba, where he was interrogated, and then sent to Seville, Spain, and then on to Madrid in 1613. He was held as a prisoner until he was exchanged for a Spanish prisoner held by the English in 1616. He immediately went back to his occupation as a ship’s pilot, and took a shipment of cattle to Jamestown, Virginia in 1619 under some-time pirate Thomas Jones. In 1620, he was hired to be the master’s mate and pilot of the Mayflower, on its intended voyage to Northern Virginia. While the Pilgrims were exploring Cape Cod and Plymouth Harbor, the shallop was caught in a storm and Clark brought them safely ashore at an Island, which is to this day known as Clark’s Island. After returning, John Clark decided to settle in Virginia himself. He went to Jamestown in 1623 on the ship Providence, with the intention of settling there, but died not too long after his arrival. Much of John Clarke’s biographical history is known, but his genealogical history is less certain. He is possibly the John Clarke who was baptized in Redriffe (Rotherhithe), Surrey, England on 26 Mar 1575, and may have been the father of Thomas Clarke, an early Plymouth settler. A baptism for Thomas Clark, son of John Clark of Rotherhithe is found on 8 Mar 1599/1600 at St. Dunstans, Stepney, Middlesex, England. He may be the John Clarke who married Sibil Farron 18 Apr 1610 in Rotherhithe, or the John Clarke who married Mary Morton on 18 Feb 1598/9 in Stepney, Middlesex–or perhaps he was married twice. John Clarke had made several trips to Jamestown, Virginia, as well as to New England. According to his depositions, he began sailing in about 1603 and was a pilot by 1607. He was in Malaga in 1609 and in March of 1611, made his first voyage to America with Sir Thomas Dale, coming to the English Colony of Jamestown. He sailed as pilot of a small squadon of merchant ships. He had visited Virginia only once before, or so he said. One wonders how he got the job based on that rather slim experience. But there weren’t many English mariners experienced on the coasts of America, so Clark’s voyage may not have been out of the ordinary. There were three ships bound for the four year old colony. THe cargo was 600 barreles of flour, fifty tons of gunpower and a consignment of arquebusses, 17th C handguns. In addition 100 cows, 200 pigs, 100 goats, 17 mares and 300 soldiers were crowded into the vessels. 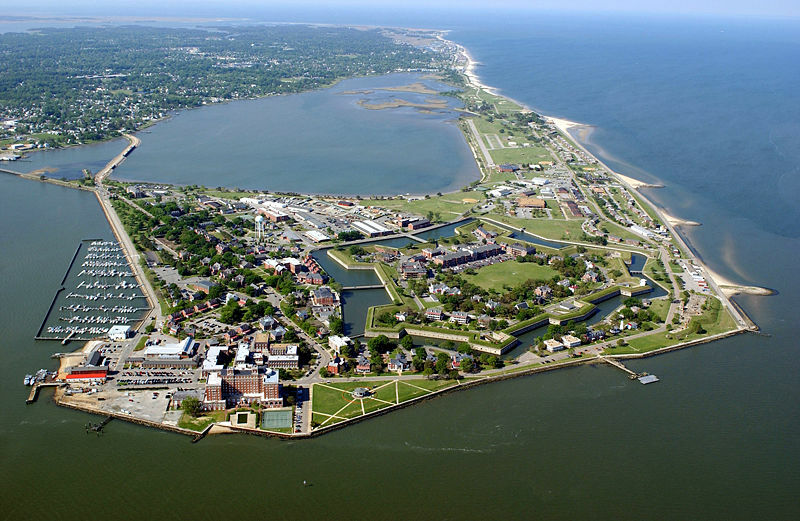 In mid June, after an uneventful crossing, the soldiers were off loaded at Fort Algernon on Point Comfort, just inside the Chesapeake Bay and the supplies were taken upriver to Jamestown. John was in Jamestown for several months when a Spanish ship was caught by the English making observations of the colony. Tensions between England and Spain were high. When Don Pedro de Cuniga, the Spanish ambassador in London sent word to Madrid of the Virginia Company’s plan to send 2,000 more setters to Jamestown the Spanish King Philip was alarmed about the threat the English settlers might pose to the Spanish treasure ships. Tow English Jesuit priests from the Catholic English seminary at Seville, loyal to Spain were dispatched to stake out Jamestown, spy on the fortifications and report back to Madrid. On Jun 14, 1610, as Jamestown recovered from a winter famine, a new Spanish ambassador in London, Don Alonso de Velasco, reported back to Madrid that the colony was in trouble and “it would be easy to undo it completely by sending a few ships to finish off the survivors.” Instead, Captain Diego de Molina and his ensign, Marco Antonio de Perez were sent on a spy mission, departing from Lisbon harbor April 13, 1611 on the caravel La Nuestra Senora del Rosario bound for Havana. Their cover story was that they were going to recover the artillery of a wrecked ship. Their real job, however, was to reconnoiter Jamestown. If there was any diplomatic fallout, the Spanish would deny it and blame their renegade Florida governor for overstepping his authority. Also aboard the Nuestra was a confidente, an Englishman who was a Spanish spy. Some mystery still shrouds his identiy, but he was known as James Limry or Limrick. The story of what happened when the Nuestra sailed into Chesapeake Bay varies depending on whether you read the English or Spanish accounts. According to the account Clark later gave to his Spanish interrogators, Molina, posing as a sailor, ensign Marco Antonio de Perez and Francisco Lembri, their English pilot-interpreter came ashore at Point Comfort from the ship’s boat and were met in all civility by Clarke, Captain James Davis and English troops. Later, Clarke says they all sat down for a meal. The caraval, the boat and the crews remained offshore. Old Point Comfort is a point of land located in the city of Hampton. It lies at the extreme tip of the Virginia Peninsula at the mouth of Hampton Roads in the United States. It formed the beginning of the boundary of colonial Virginia. After eating, Davis suggested the caravel be brought into a safe anchorage for the night and Clark was ordered to help pilot the Nuestra into position. But when Clark was safely aboard the Spanish vessel, the crew thought he was trying to move the ship into better range of an English attack for seizure. They refused to budge and Clark became a Spanish prisoner. In Clark’s report, it was the Spanish who had started it all. The Nuestra’s captain said that it was the “dirty English” who had double-crossed them by taking Molida, Perez and their interpreter prisoner and that Clark was trying to lure the Spanish ship into danger. They claimed Clark was made captive by the Spanish crew when they discovered that their leaders were being held by the English. The captain of the La Nuestra upped anchor and escaped back to Havana, leaving behind the two Spaniards and the English spy as prisoners of the Virginians. King Philip instructed his ambassador to appeal to King James “to procure the liberty” of the two Spaniards and to insist that the Nuestra had been on a search for a lost vessel, not spying. All the Spaniards had to show for the mission was John Clark, or Juan Clerg as he is named in the transcripts. From the record of his interview of July 23, 1611 it is obvious that Clark told the Spanish what they wanted to hear. He drew charts of the bay showing the fathoms. He described the fortifications in detail, the placement and sizes of the guns, the number of men and boats. He explained how the colonists grew corn and gathered walnuts for food and sometimes there was fish and sometimes there was not. Clark expanded on the truth which might have saved his life. He said a hundred leagues into the mountains, there was gold in Virginia. Hearing that his ambassador in London was arranging atransfer of prisoners, King Philip ordered that Clark be shipped from Cuba and “brought henceforth to the prison of the Casa de la Contratacion in Madrid,” and treated well. He was then taken to Seville, Spain, and then to Madrid where there exists a record of his 18 Feb 1613 examination. Little changed in his account, except that this time he said he was forty years old and a Roman Catholic. He calls himself 35 years old in his 1611 deposition, and calls himself 40 years old in 1613, giving his residence as London. He was released to the English in 1616, in a prisoner exchange between England and Spain. Alternatively, he was ransomed by King James I of England. Clark was still in Madrid under house arrest in 1616, four years after his arrival. The Council of War saw to it that his keepers maintained him “in good custody and guard, givng him good entertainment and comforts” and paid the prison charges as well as his food and lodging. Finally, the spy-swap deal was done. For the release of John Clark in Madrid, Captain Molina was the only prisoner handed over to the Spanish ambassador in London. Ensign Perez died in captivity and it was reported that the traitorous English spy was hanged by Sr Thomas Dale, Virginia’s governor. This 1619 trip was to deliver another cargo of cattle to Virginia with Captain Thomas Jones of the Falcon, a some-time pirate. John was the Masters Mate and pilot of the Mayflower, although he did not sign the Mayflower Compact. He accompanied the Pilgrims on many of the exploring parties, piloting the shallop. Clarks Island in Duxbury Bay is named after him, because he miraculously brought the shallop ashore during a strong storm on one of these expeditions. While the Pilgrims were exploring Cape Cod and Plymouth Harbor, the shallop was caught in a storm and Clark brought them safely ashore at an Island, which is to this day known as Clark’s Island. John Clarke was hired to be the Masters Mate on the Mayflower by the Virginia Company and the Merchant Adventurers because he had been to the American coast on several prior occasions. The Mayflower was used primarily as a cargo ship, involved in active trade of goods (often wine) between England and other European countries, (principally France, but also Norway, Germany, and Spain). Like many ships of the time, the Mayflower was most likely a carrack with three masts, square-rigged on the foremast and mainmast but lateen-rigged on the mizzenmast. At least between 1609 and 1622, it was mastered by Christopher Jones, who would command the ship on the famous transatlantic voyage, and based in John Clarks hometown, Rotherhithe, London, England.Details of the ships dimensions are unknown, but estimates based on its load weight and the typical size of 180 ton merchant ships of its day suggest an estimated length of 90–110 feet and a width of about 25 feet. The ship had a crew of twenty-five to thirty, along with other hired personnel; however, the names of only five are known. August 15, 1620 Sailed from Southampton, England. September 16. Sailed from Plymouth, England. November 16. William Butten died at sea. Nov 19. First sighted Cape Cod. Nov 21. Signed “The Compact.” Anchored in Cape Cod Harbor and went ashore. Nov 23. Took the shallop ashore for repairs. Nov 25. First exploring party set out by land. December 7. Second exploring party set out with the shallop. 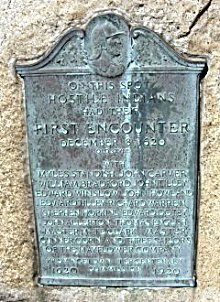 First Encounter Monument - ON THIS SPOT HOSTILE INDIANS HAD THEIR FIRST ENCOUNTER DECEMBER 8, 1620 old style WITH MYLES STANDISH JOHN CARVER WILLIAM BRADFORD JOHN TILLEY EDWARD WINSLOW JOHN HOWLAND EDWARD TILLEY RICHARD WARREN STEPHEN HOPKINS EDWARD DOTEY JOHN ALLERTON THOMAS ENGLISH MASTER MATE CLARK MASTER GUNNER COPIN AND THREE SAILORS OF THE MAYFLOWER COMPANY PROVINCETOWN TERCENTENARY1620 COMMISSION 1920 John F Paramino Sculp. 1922 Boston, Ma. AND THREE SAILORS OF THE MAYFLOWER COMPANY. IN THE COMMONWEALTH OF MASSACHUSETTS. Dec 12. Found the wigwams, graves, etc. Dec 14. Edward Thomson died. The first death after reaching Cape Cod. December 16. Third exploring party set out with the shallop. Jasper More died. Dec 17. Dorothy (May) Bradford died. Dec 18. James Chilton died. First encounter with the Indians. Reached Clarks Island at night. [Due to our ancestors extraordinary piloting skills! Dec 20. Third exploring party spent the Sabbath on Clark’s Island. Dec 21. FOREFATHERS DAY.Third exploring party landed on Plymouth Rock, and explored the coast. Dec 25. The Mayflower set sail from Cape Cod for Plymouth, but was driven back by a change in the wind. Dec 26. The Mayflower arrived at Plymouth Harbor. 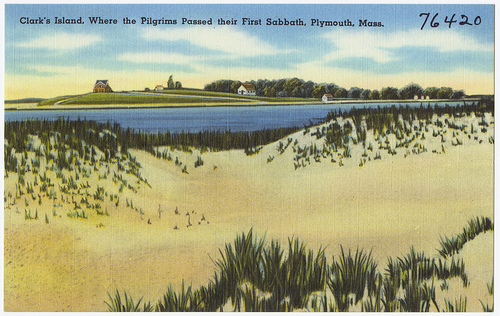 First Sabbath Service of the Pilgrims - 20 Dec 1620 "The next day, the Sabbath, the men returned to an immense rock at the center of Clarks Island and gave God thanks for his mercies in their manifold deliverances." During the winter the passengers remained on board the Mayflower, suffering an outbreak of a contagious disease described as a mixture of scurvy, pneumonia and tuberculosis. When it ended, there were only 53 passengers, just more than half, still alive. Likewise, half of the crew died as well. On March 21/31, 1621, all surviving passengers, who had inhabited the ship during the winter, moved ashore at Plymouth, and on April 5/15, the Mayflower, a privately commissioned vessel, returned to England. Mr. Deputy acquainted the court, that one Mr. John Clarke beinge taken from Virginia long since by a Spanish ship that came to discover that plantation; that forasmuch as he hath since that time done the companie good service in many voyages to Virginia, and of late went into Ireland for transportation of cattle to Virginia, he was an humble suitor to this court, that he might be admitted a free brother of the companie, and have some shares of land bestowed upon him. John was given two shares in the Virginia Company for his service. 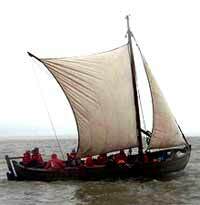 He sailed to Virginia on 10 April 1623 in Daniel Gookin’s ship, the Providence, and died shortly after he arrived. A day or so after [14 Apr 1622] Mr. Gookin’s ship, the Providence, with John Clarke as pilot, arrived at New Port Newce with forty men for him and thirty passengers besides. Which ship had also been long out and suffered extremely in her passage. Massachuetts Historical Society Proceedings, 3d series, 54 (1920):61-77, “John Clark of the Mayflower”. American Historical Review 25:448-479, “Spanish Policy toward Virginia, 1606-1612; Jamestown, Ecija, and John Clark of the Mayflower”. The Genesis of the United States, by Alexander Brown, 1964, pages 854-855. This entry was posted in 13th Generation, First Comer, Historical Monument, Immigrant - England, Line - Shaw, Place Names, Sea Captain, Storied and tagged captured by the Spanish in June 1611, Clark's Island, Jamestown, Mayflower Pilot. Bookmark the permalink. I am related to John Clark and Mary Morton. I had thought this marriage to not be right because cold not find any data to historically clear it. What other historical evidence is there. Just trying to be vigilant. I am also related to Arthur Howland Sr. and Jr. via Elizabeth Prence who married Arthur Jr. It is said that Thomas was married to Mary Collier and had five daughters according to his will I printed. Jane,Mary,Sarah, Elizabeth, and Judith. I know Thomas was married nine times and had more daughters and one son Thomas correct who died young. So all the Prences come from women ancestors correct. I am looking for more. I know now I most be related to a lot of other pilgrims through sisters and half sisters. So John CLark and Lt. Willam Clark (1609-1690- Northampton) arent related? John Clark is my 9th Great Grandfather..
John Edward Clarke, b 1575 d 1623, is my 11th great grandfather. Listed on the “Living and Dead in Virginia” under living at Jordan’s Journey is an Edward Clark with a wife and child. Edward and family are absent on the 1624/5 Muster for Jordan’s Journey. If John Edward Clarke arrived sick it would make sense that he would stay with Sybil Farrar’s relative, William Farrar, my 9th great grandfather, who was living at Jordan’s Journey. If this is true John Edward Clarkes body may be the second older male recovered from the site. Do you know if DNA was recovered from the Jordan’s Journey body? Can anyone debunk this theory?